Oregano, Origanum vulgare, is a small perennial herb that is native to Europe and the Mediterranean region where it grows on dry, sunny slopes and along roadsides. Like many of its relatives in the mint family, it has been used medicinally and in cooking for thousands of years. The creeping stems of oregano grow into a wide mat, while the flower stalks are upright, growing to 24 inches tall. The small leaves are slightly furry and grey-green in color. Flower clusters, which appear from July to September, are light purple, pink or white. They are edible, and are nice as cut flowers in fresh or dried arrangements. The herb is sometimes called wild marjoram and is confused with marjoram, Origanum majorana, which is a smaller plant with a sweeter, milder flavor. Greek oregano is a variety, Origanum vulgare var. hirtum formerly called Origanum heracleoticum. The plant likes cool weather and soil that drains well, is slightly alkaline and is rich in organic matter. With good drainage, it can also do well in poorer soils and be drought tolerant. Plant in full sun or, in regions with very hot summers, in partial shade. Oregano is evergreen in temperate climates and hardy to zone 4 or 5, but can be grown as an annual in colder climates. Mulching over the winter greatly increases the chances of your plant returning year after year. Plant transplants in spring. Space plants 10 inches apart. Divide plants every few years for more vigorous growth. To increase leaf production, pinch off flower stalks as they appear. For best flavor, propagate plants by taking root or stem cuttings or divisions of the best plants. Harvest anytime for kitchen use. To cut large quantities for drying, harvest in late spring before flower buds appear. Cut plant back to 3-6 inches and hang cuttings in a dark, well-ventilated area for several weeks. In the landscape and garden, it makes a fragrant ground cover or border plant. The smaller varieties work well in rock gardens where it can be neatly pruned or allowed to cascade. It's very nice in containers with chives and annual flowers like alyssum and corn poppies. There are ground cover varieties that have been promoted as a lawn alternative. The medicinal applications range from use as an antiseptic and tonic to treatment for asthma, fatigue and menstrual and stomach pains. 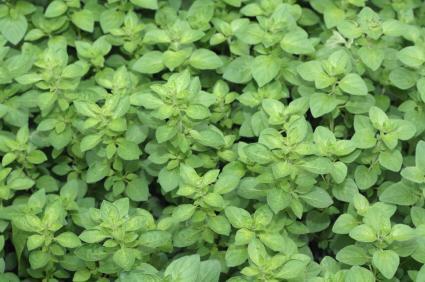 In the kitchen, oregano is the characteristic flavor in pizza, spaghetti and other Italian dishes. It is also used in English and French cooking. It makes a wonderful marinade for mushrooms or vegetables when mixed with olive oil, garlic and red wine vinegar. The flavor intensifies when dried, and pairs well with basil and tarragon.